The Senior Center Bus provides transportation for current members age 60 and older who reside within the Grand Blanc School District. Participants must sign a bus policy. Transportation is limited to the Grand Blanc Senior Center, Doctors Offices, Grocery Stores, Post Office and Barber/Beauty Shops within the Grand Blanc School District. The Center transportation services cannot provide rides to physical therapy or medical procedures other than routine doctor and dental appointments, blood draws, and x-rays. Transportation arrangements must be scheduled with the Center Office. In addition, all questions regarding transportation must be directed to the Center Office. The driver is unable to schedule or make changes to transportation arrangements or answer questions. Transportation arrangements must be made 24 hours in advance. There is a $4.00 charge for round-trip transportation. Any additional scheduled stops are $2.00 per stop and must be scheduled at the time of the original appointment. The fees may be paid in advance or upon boarding the bus. For convenience, please have small bills or exact change. Transportation hours are Monday through Friday 8:00am - 1:00pm. Please note: if the Grand Blanc School District closes due to inclement weather, the Senior Center bus will not run. Do you have questions regarding your Medicare or Medicaid health benefits? Our MMAP Counselor is available by appointment only on Tuesdays and Fridays. Please call 1-800-803-7174 or 810-695-3202 to schedule your appointment. The Center has partnered with the Alzheimer's Association to offer a FREE Alzheimer's Support Group. This informative group meets the second Tuesday of every month from 6:00pm-8:00pm. The center has volunteers available to help process Bridge Card applications. Individuals must be 60 or over, reside in Genesee County, and income qualify. Please call the office to schedule an appointment. When cancer strikes you or your family reliable information is vital. Talking to a career survivor will help you or your loved one successfully cope with this always-treatable, often-curable disease. Call (800) 433-0464, twenty-four hours a day to be matched with a survivor with your type of cancer. Let National Center Hotline Help you through the shock of a cancer diagnoses at absolutely no charge. The Center offers luncheons 5 days per week. The meal is provided by Genesee County Community Action Resource Department. For individuals 60 & over living in Genesee County there is a $2.00 requested donation. For individuals under 60 or living outside of Genesee County cost is $3.50. Please call for reservations by 1:00 the day prior. For more information please Contact the center. The Grand Blanc Senior Center offers FREE blood pressure checks on Tuesdays from 12:00-2:00 P.M. Contact the center for more information. 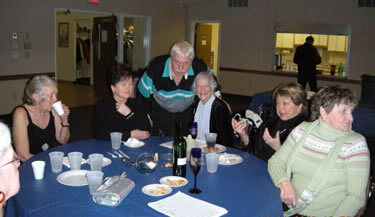 The Senior Food Program of Genesee County offers homebound meals and the Jewish Federation offers kosher meals. It is available to any resident of the county over 60 years of age or their spouse. The cost is $1.75 per meal. Call (810) 235-5367 or (810) 767-5922 for kosher meals. MiCAFE stands for the Michigan Coordinated Access to Food for the Elderly. Could you use extra $$$ each month? If you answered yes, then you might qualify for the MiCafe program. Eligible participants could receive up to $60 per month towards purchasing groceries. The Bridge Card helps pay for food so seniors can use their cash to buy things like medicine or pay for heat, lights, water or make repairs to their home. Contact us for an appointment. The Grand Blanc FISH Program has an emergency food pantry for those in need. For more information call (810) 695-1880. The Food Bank has provided more than 17 million lbs. of food. For more information please call (810)235-4990. The Center offers an annual Health Fair in October. Please check back for future updates. If you would like to sign-up for a table please Contact us. The Center has guest speakers from time to time. Please check the newsletter for updates. If you would like to be a guest speaker, please Contact us. The Center has hosted many health screenings, such as vision, hearing, glucose, and pulse ox. Please check the newsletter or call the center for more information. If you would like to provide a health screening please Contact us. The center has a Medicare/Medicaid specialist available to assist with questions, concerns, or enrolling in benefits. Call the center to schedule an appointment. Our MMAP counselor is available on Tuesdays from 1:00-3:00pm by appointment. If you're a resident of Genesee County, under 65 and without health care coverage, the Genesee County Health Plan could benefit you. For more information call the Genesee Health Plan at (810) 232-7740. Free legal help is available through the Senior Law Center for the following cases: Elder Abuse, Housing, Abusive Guardianship, DSS Assistance, Medicaid/Medicare, Social Security/SSI, Nursing Homes, and Spousal abuse. To schedule an appointment call (810) 234-2621. The center has a medical loan closet. Loan closet hours are Monday-Friday from 8:00am -12:00pm. We have walkers, canes, and elevated toilet seats. If you are in need of medical equipment call the center for more information. We also take donations, so if you have equipment that you are not sure what to do with, please donate them to the center. Contact the center for information regarding loans or if you would like to donate a durable medical supply. Come check out our new library! Everything we have is from generous donations-Thank You! We ask that you sign in each time you visit. If you would like to donate Contact the center. MMAP has volunteers available to assist you with questions, bills, or statements from Medicare or Medicaid. They can also assist in counseling on Medicare Part D Prescription Program. Call the center for an appointment.Contact the center for more information. The Grand Blanc Senior Center offers free income tax preparation every Wednesday beginning the 1st Wednesday of February through the Wednesday before the tax deadline. Loans are provided at 1% on home repairs such as roofs, windows, ramps, etc. through the 504 Loans grant Program. For more information call (810) 230-8766. This federally funded work-training program is operated by AARP. To apply you must be 55 or older with low income. Program participants are placed in minimum wage positions with a nonprofit organization with the goal of finding a higher-paying position outside the program. Call (810) 766-1470 for more information. Michigan seniors, low-income families, and unemployed resident?s can apply for assistance in paying utility bills. Contact Consumer?s Energy @1-800-477-505 for more information. KISS stands for Keeping Independent Seniors Safe and is designed to assist older adults live safely and securely in their own homes. KISS provides a daily check for people 55 and older by having the participants call the KISS office each day to verify their safety. If a participant fails to call in, emergency procedures are immediately put in place. For more information call or to participate, call (810) 239-7671. If you know someone that is unable to read regular print then call the Library for the Blind and Physically Disabled @ (810) 732-1120. Prostate Cancer in men over 50 is unfortunately common. It is vitally important that you get tested. If you can not afford to be tested contact Hurley Medical Center Geriatric Outreach @ (810) 767-3600. Mott Community College Dental Hygiene Clinic, located on the 2nd floor of the Mott Building (1401 E. Court St.) offers dental hygiene services at a minimal cost to anyone 55 or older. To schedule an appointment call (810) 762-0493. Michigan's Long Term Care Ombudsman is the voice for residents of nursing homes, homes for the aged, and adult foster care homes. They answer your questions and concerns regarding quality of life and quality of care in licensed long term care facilities. The center has used cell phones available. These phones are for 911 use only, but they are wonderful to carry in your car in case of an emergency. There is help for low-income seniors who are eligible for Medicare. The Medicare Savings Program pays the Medicare Part B premium for eligible seniors. For more information and to find out if you qualify, call 1-800-803-7174 extension 247. Free eye care for persons 65 and older. For free comprehensive medical eye exam, and up to one year of treatment for conditions diagnosed through the exam by Eye Care America. For more information, call 1-800-222-3937. Francine Cullari is a local lawyer that specializes in wills and trusts. For more information, call (810) 695-7400. The VA's best kept secret -- Aid and Attendance Pension. For more information, call Joseph N. Vitale at American Retirement Planning & Benefits, Inc., American Retirement Solutions at (810) 667-9360 or email him at jnvitale@americanretsol.com. Through this program, senior citizens may adopt qualified pets (adult and sterilized) at no cost. Seniors who own and interact with pets are often happier, healthier, and less lonely. If you would like to volunteer, adopt, or donate to the Humane Society, call (810) 744-0511. Our van is available 5 days per week by appointment only. For reservations, please call the center directly--not the driver. When scheduling please inform the staff of any and all stops you need to make. This will help us schedule other appointments accordingly. Thank you! Please Contact the center for transportation information or to schedule a ride. Please note the van is for those who do not have other means of transportation-thanks you. This service is helpful to persons with disabilities, homebound individuals, or persons with limited or no transportation. The curb-to-curb services is available Monday through Saturday from 6:30 AM to 10:30 PM and Sundays 9:00 AM to 5:30 PM. Reservations can be made between one and fourteen days in advance. Reservations must be made by 5:00 PM the day before. Regular fare for a one-way trip is $2.00. Senior-citizens and mobility-impaired is $1.50. For more information contact Grand Blanc MTA @ (810) 780-8960 or mtaflint.org. Cancer patients who live in Genesee County can call for transportation to their treatments at McLaren Cancer Center or Genesys Hurley Cancer Institute. For more information call (810) 733-3702.